Winter Camping is a completely different activity. Most people who have tried it, don’t like it and most people’s first experience was through the scouting program. In essence, the dangers of winter camping aren’t all that different from numerous summertime outdoor activities. The real risk comes from not being prepared or jumping into winter camping with too much enthusiasm. The situation is predictable and repeats itself every winter. The typical scout scenario goes something like this. Scout Troop 32 decides to go on a winter camping trip. Mom and Dad run to Walmart and buy a 0 degree Ozark Trail sleeping bag, and tent with full rainfly. Junior has warm clothes at home, so he doesn’t need anything else. Friday afternoon they drop the enthusiastic lad off at the meeting place and wish him well. Saturday afternoon they pick a frowning junior up blue lips, black toes, hypothermia and all. Junior never wants to camp again. Sadly, adults who laugh, make the same mistake with just a few minor alterations. The result is usually the same, replace junior with boyfriend/girlfriend or amateur adventurer. 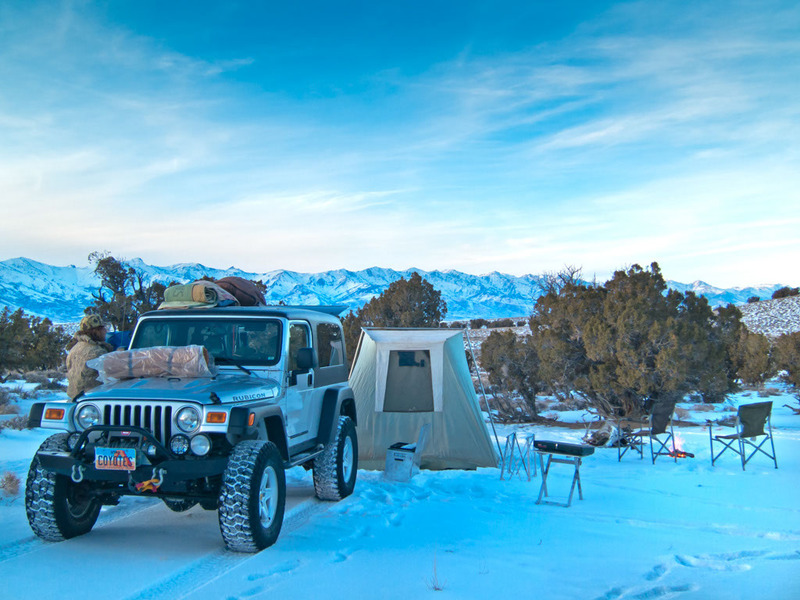 There are two major things that people should do when it comes to winter camping. People always know they are going to experience cold when camping in the winter. How they tolerate and experience the cold is something completely different. Step 1-Camp in your backyard, during winter, lots of times. If you get cold in the middle of the night run inside get more blankets. You can always stay inside warm up and try again with more blankets from the beginning. This experience will either reinforce your desire to partake in winter camping activities or discourage you. Step 2- Once you have completed sleeping in your yard at cold temperatures, it is time for you to shop for gear. I will cover this under the preparing for winter camping section. Step 3- Use your new gear in, you guessed it, your yard. Pay attention to the winter temperatures where you live and the winter temperatures where you are going. Try to plan your first winter trip around similar temperatures or make it a point to camp in your yard when the temperatures are getting as cold as where you plan on going. Step 4- Practice all the things you plan on doing while winter camping in your yard. Practice making fires. Use wood that is wet, snowed or rained on. Get your technique down, so you know what you are doing when its -5 degrees. You will be amazed at how difficult it is when you are shivering. 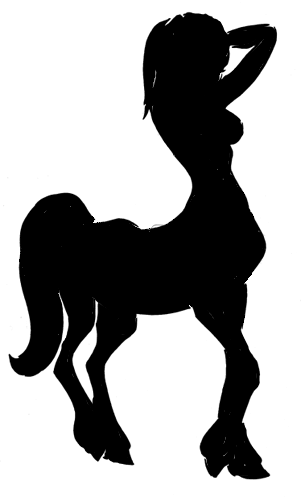 You will also be amazed at how easy it is when you know what you are doing. One thing than backyard practice does is to give you a small idea of what you are in for. You may make the decision early on that it is more trouble than you feel it will be worth. Step 5- Get out in the real world, but not too far from the car. The first few times, maybe even season, you decide to move from the backyard to the wilderness, stay close to the car and major roads. If you get too cold or have problems, you can always have extra supplies, blankets or emergency stuff inside your car. If you are close to the road you came in on, the worse case scenario is you know which direction to head. The success and enjoyment of winter camping are very reliant on the equipment that you have. Many people look at a sleeping bag that says it’s 0 degrees and think, wow that’s what I need. Nothing could be further from the truth. Check out this article on [how to choose a sleeping bag]. It does a great job explaining the hokeyness that surrounds the sleeping bag industry. The same hokeyness applies to tents and all other outdoor recreation equipment. Your sleeping bag needs to be more than adequate. If you are going camping in an area known for temperatures that are around 0 degrees at night, I would suggest getting a sleeping bag that is actually about -15 degrees. These sleeping bags won’t be cheap; you won’t find them at Wal-Mart. Don’t complain about the money, because a good sleeping bag is still cheaper than medical treatment for frostbite. Spending a chunk of money preserves more dignity than naked spooning with a stranger named Bruce. The sleeping bag is only part of the nighty night equation. A sleeping pad is needed to prevent the ground from making you cold. No, not one of those air mattress monstrosities that come with the battery powered inflator. Instead, consider investing in something like a cold winter or 4 season Thermarest. The insulation between your sleeping bag and the ground is so important that many survival guides suggest ground insulation as more important than shelter and seeking water. The mantra of full rainfly is quite misleading when it comes to choosing a tent, especially when it comes to four season tents. For winter camping it’s wise to have a four season tent. The main difference between a four season tent and the more common three season tent are the strength. 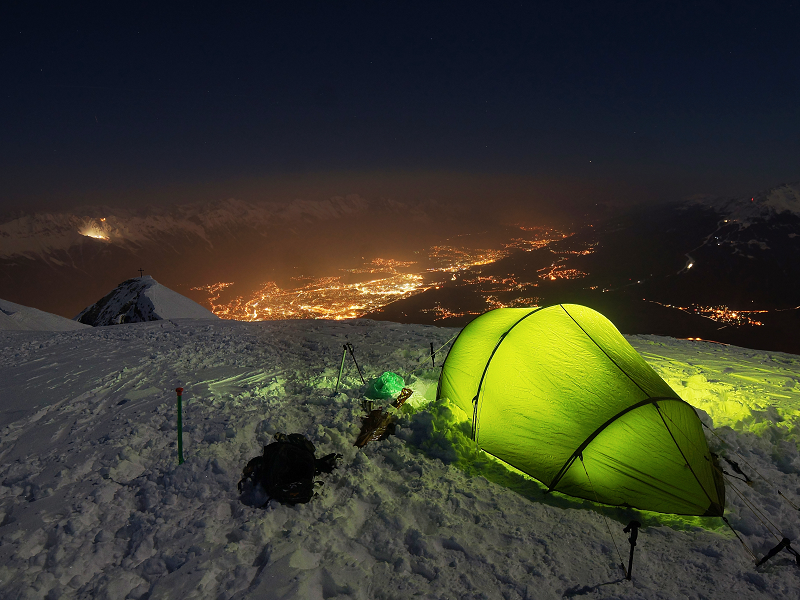 Four season tents are engineered to support the weight of snow. These tents usually have four poles to help hold the tent firm under weight and extreme weather. Often, these tents will be single wall, with no rainfly. They won’t feature lots of mesh or large zippers on the roof. You can put off purchasing a four season tent if you are camping in clear weather, or close to your car. However, don’t buy a cheap tent expecting it to keep you dry. To learn more about how to select the best tent, read our guide to buying a tent. Many people make the mistake of over bundling. They often look like Marvins little brother from a Christmas story with the biggest baddest warmest piece of clothing they can find. One thick layer or multiple thick layers are an epic no-no. The secret to warmth and safety is multiple layers. One warm layer is great for warmth but can often lead to a pattern of overheating cooling down and then hypothermia. Someone gets too hot starts sweating takes the heavy coat off or unzips it. The cold air freezes or cools the sweat making the person cold. They put the coat back on, and the body’s temperature regulation system becomes taxed. Having an adequate layer system allows someone to adjust in increments. Adjusting in increments prevents the possibility of excessive swings in body temp, conservation of energy and decreases the risk of medical issues. 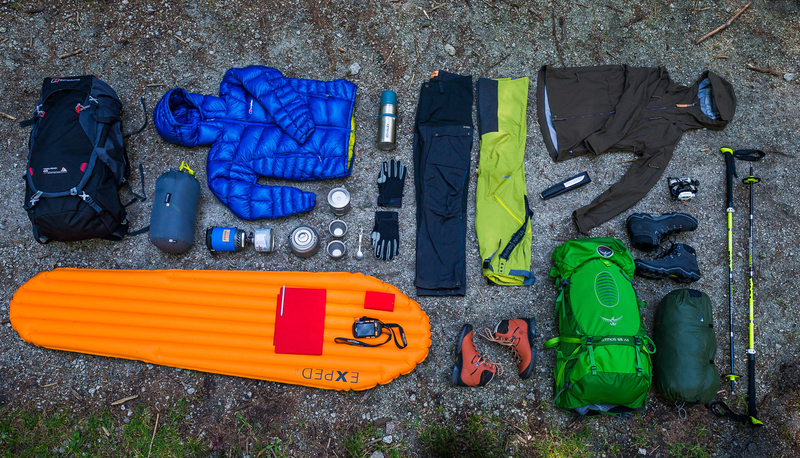 Check out our article on dressing for winter camping. Fire building during the winter, at times, can be a significant challenge. When building a fire challenges such as wet wood, ground moisture and moisture falling from the air can all be significant barriers to building a fire. 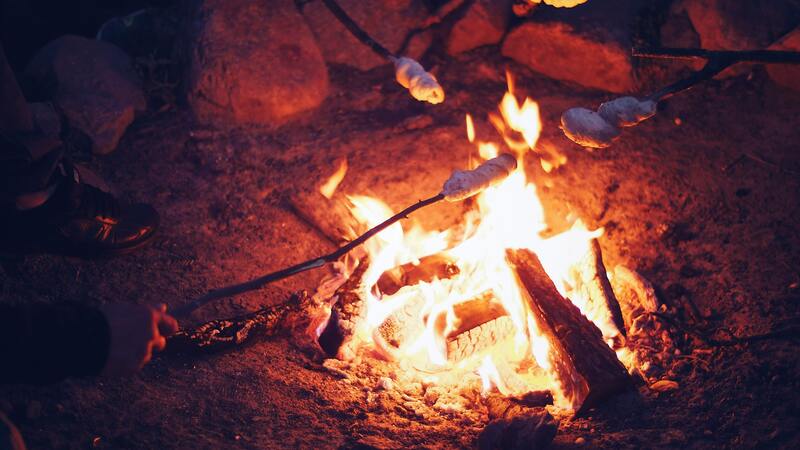 If possible, when building a fire, dig down to the ground or build a base of rock. Lay two logs parallel on top of them and use dry shavings in the middle to start the fire. There is no shame in using magnesium shavings or fire paste which are common items in the camping section of most stores. 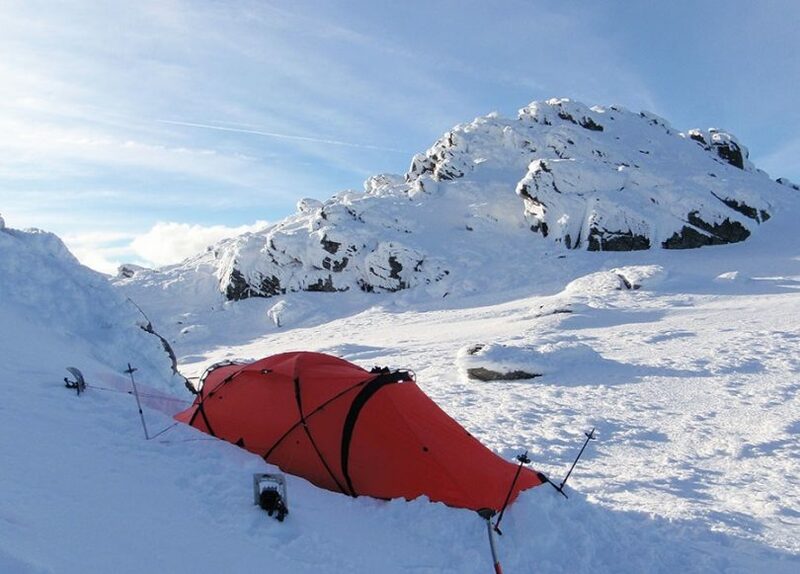 Winter camping often creates hydration problems. A lot of times the water you brought with you will freeze. Many people will turn to snow as a source of hydration. Snow shouldn’t be a problem if you can build a fire to melt it. 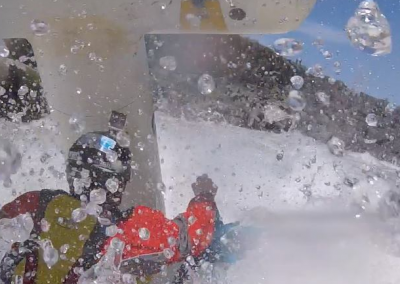 Avoid putting the snow directly in your mouth. Your body uses an insane amount of energy melting it, and it risks lowering your core temperature. If you aren’t savvy with cooking over an open flame, then you will probably need a camping stove. There are two types of camping stoves. There are the canister stoves and the liquid fuel stoves. A canister stove uses compressed gas mixtures. They are easy and convenient. They are also available in all cost ranges with a variety of features. The downside to the canister stove is that it is air-gas fuel. When the temperatures get cold, and the air pressure changes it can greatly affect the performance of the stove. The liquid fuel stove is slightly more difficult to work with than the canister stove. Instead of using gas it relies on a liquid component like white gas, kerosene and sometimes unleaded. Liquid fuel stoves are usually more expensive but work better in a wide range of conditions. The biggest dangers and health risks in winter camping are hypothermia and frostbite. Hypothermia is when the bodies temperature starts to drop lower than 98.6 degrees. Once your body temperature gets below 95, you are in a state of hypothermia. Once in the state of hypothermia, your internal organs won’t work normally. Untreated hypothermia leads to the complete failure of your heart and lungs. In the event of hypothermia, get someplace warm. If someplace warm isn’t available, you may need to share a sleeping bag with someone. Bonus points if he is large and named Bruce. Frostbite occurs when your skin and the underlying body tissues freeze. It can occur even if you are wearing gloves. The most likely places you will receive frostbite are fingers, toes, nose, ears, cheeks, and chin. Frostbite requires medical attention because it can damage the affected body parts. Remember winter camping moreso than other activities depends on preparation and proper equipment.